Bancroft, an independent, coeducational, college-preparatory day school, prepares talented, well-qualified, and motivated college-bound students, PreKindergarten through Grade 12, to pursue and realize their academic, personal, and social potential. We provide a comprehensive, caring, and creative curricular and extracurricular program that fosters an experience of excellence for each student. Inspired students, a superior faculty, and engaged families thrive in our diverse, safe, and supportive community. We afford students the opportunity to discover their passion in life and to learn to embrace confidently and responsibly the moral and ethical challenges of being lifelong learners, teachers of others, and citizens of an increasingly complex global community. 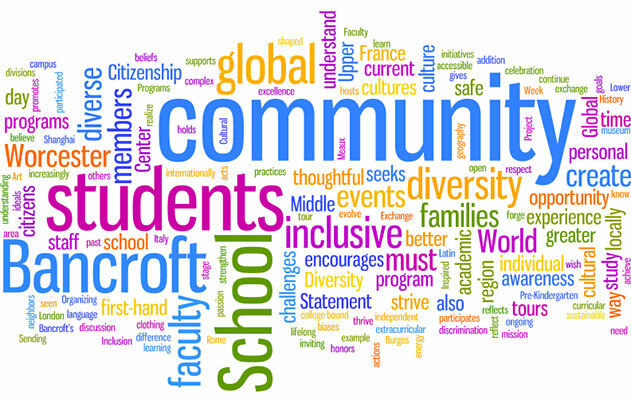 We believe that, in order to fulfill our mission, a healthy diversity must define Bancroft School. We believe in the dignity of the individual and the celebration of difference. We believe that our community must aspire to the best democratic ideals. We believe that a diverse and inclusive community is a better learning community. We believe that our sense of justice and inclusion will continue to evolve. We strive to create a diverse and inclusive community in which each individual is safe, known, and valued. We strive to create a school culture that affords each member the opportunity to construct a personal identity in an environment that is open, inviting, and accessible. We strive to forge a community devoid of all forms of prejudice and discrimination. We strive to build a community of families, faculty, and staff that reflects the diversity of the greater Worcester region. We strive for an inclusive community that gives voice to all members, encourages challenges to biases and assumptions, and promotes ongoing discussion of these important topics.